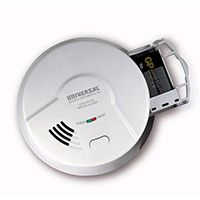 The 976LR alarm from Universal Security Instruments is a 2-in-1 system that provides protection against smoke as well as fires. The alarm uses Ionization Technology to protect against fast flaming fires. It is operated by a heavy duty 9-volt battery, and ideal for use in dorms, apartments, houses, and mobile homes. Installation is simple, as no wiring is included. The battery drawer is easy to access, making battery replacement simple when necessary. When it does require changing, an alarm will sound.